Yesterday afternoon, the sun was shining. In fact, it was a very beautiful day. I celebrated this in my own time-honoured fashion. Finding I had a rare two hours all to myself, I drew the blinds and put on a movie. 'Prometheus' was one of those films that I had looked forward to with much anticipation, from long before its cinema release. Then, after it came out, the negative reaction (shall we call it a backlash?) dissuaded me from ever forking out theatre-sized money on it. “I’ll catch it on the telly in a few years,” I said. So yesterday was the day. I punched the couch into an accommodating shape, assembled some cushions, and had a good old ‘watch’. This isn’t a movie review post. There’s been a few of those but this isn’t one of them. There’ll be a little bit of a review but that’s all. This is more a ‘head above the parapet post’ with possibly a scrap of a ‘being facetious to make a point’ post thrown in as well. That was it. That was the review bit. Don’t get me wrong, I can see flaws. I’m not an ape. I just thought it was engaging and rather beautiful with a bit more body-horror than I had expected and a seemingly endless flow of ‘Alien’ tropes, nods, and variations on a theme. Expectation plays quite a part, doesn’t it? I had been ably primed to detest it and I reckon that gave me a bit of room to find some enjoyment. Also I was watching it from a time and a position where I might otherwise have been part-digesting a thirty year old episode of 'Columbo', so all that heightened cinematic first-run angst was long gone. Also, I seem to be currently going through a phase of ‘liking stuff’. I think that may be because I am restricting myself to consuming things that I have a fair chance of liking, yesterday having been something of an exception. 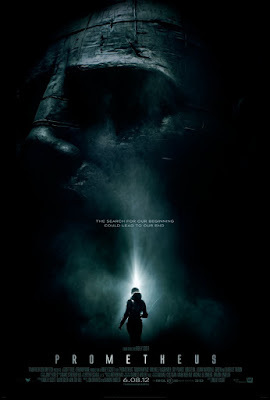 Whatever the reason, I had a good time with ‘Prometheus’ and came away fairly happy. Is it best to keep this desperate experience of potentially unpopular enjoyment to oneself, hiding it away under a social-media-free bushel? Or to take arms against a sea of troubles, etc? There are many people around who hated the damn flick. People who I respect and, occasionally, admire. People who know their stuff. People who know their stuff a damn sight better than I do. Do I want to be belligerent and force my differing opinion? Do I want to poke my head above the parapet? Do I want to lay low and, whenever a negative opinion of this film pops up again, just fall silent and wait until it passes? There are the two options. Option A and Option B. As has so often been the case in my life, when faced with Option A and Option B, I choose Option C.
Option C, in this case, is to not just mutter that I liked it but to slightly make a Federal Case about that or, at the very least, a blog post. It’s a tricky thing, the opposing view. There’s a lot of elements to how it is received. I know places where it is positively welcomed. Huge disagreements break out and flourish like a wild fire and then, when all has been said, the protagonists reaffirm their undying love for each other and move on together. I love those places but, damn it, they are few and far between. You don’t have to look far on this Interweb to find good people virtually slaying each other over their differences in opinion on something. The average is three comment exchanges before it all descends into name-calling, personal insult and threats of grievous bodily harm. It’s partly understandable, I suppose. We can’t help but view ourselves as intelligent people, worldly people, people of taste and distinction. Perhaps, then, it is natural that our subconscious would try to tell us that anybody who takes an opposing view to our own is less intelligent than we are and worthy only of our derision. I think, when someone peacefully expresses an alternate view to our own, we shouldn’t only consider and respect it, we should jump up and bloody dance around for joy that they did so. Firstly, they’ve shown an element of trust and respect in raising the dissenting voice and, secondly, they reaffirmed the most crucial fact of our existence. That we are not sheep. What kind of world would it be, if we all spoke the same language, if all our experiences were exactly the same, if we all believed in the same god... if we all hated Prometheus? You feel differently to me? Thank heavens! Come and have some cake and tell me more about why that is. Let’s have a party and talk it through. Let’s learn a little from our differing views. Just this very morning, as I was twirling through some Facebook updates, I saw super writer and online pal Jason Arnopp waxing favourable about something he likes. It matters not what it was but, if you’re curious, it was the big wheel in Brighton which is being dismantled today. A person of a different view popped up in the comments section and (rather good-naturedly, one feels) pounded a bit on our Jason. “What the hell are you talking about man?” he asked. And, as if reading my mind, Jason replied. I watched Prometheus recently and, even given that it had been written as a prequel to the first Alien film but was only released in 2012, I forgave Ridley Scott for what I perceived to be its rather dated visuals. I felt that the ending was weak too but SciFi isn't really my preferred genre. I really should try to remember that rather than thinking about it about 7 minutes before a film ends. I'm just thinking that it's a good job that I never bother to read reviews because I probably wouldn't ever watch any more films at all. For many years I’ve been a faithful reader of SFX and I subscribe to a number of news feeds discussing science fiction in all its forms so I usually know what’s coming before the general public do. Even before SFX existed or the Internet had monopolised our lives I was still the same. I knew years in advance that Tim Burton was planning to have a crack at Batman, I read everything I could and was, predictably, disappointed because nothing can live up to the hype and part of the problem with all science fiction films these days—it really doesn’t happen with other genres—is that we allow others to decide what we should expect even before the first reviews come out. Apparently Superman v Batman: Dawn of Justice is not a very good film and yet its broken box office records because people want to see for themselves. It’s a bit perverse really and let’s hope it’s not a start of a new trend although if it is the blame probably lies at the feet of Donald Trump whose success—I use the word loosely—lies simply down to his ability to be (journalistically-speaking) omnipresent: hell, let’s just vote for him and see what kind of mess he makes. By the time I got round to watching Prometheus I’d stopped reading about stuff in depth. I knew the film was being made, I’d seen a few stills and had an idea what the storyline was and I was happy with that. I’d’ve gone to see it no matter what just as I plan to see the sequel, Alien: Covenant whenever it appears irrespective of what anyone says. I went to see Prometheus early on so I was only vaguely aware it wasn’t being critically acclaimed but that wouldn’t’ve worried me because Alien3 wasn’t a hit right away and it’s only now people are starting to appreciate it if only because it wasn’t as bad as Alien: Resurrection and is a masterpiece compared to the two AVP films, all of which I’ve seen and even own. I was disappointed with Prometheus. Worse, I came away confused. Visually it was flawless and the acting was fine but something didn’t add up; there were too many unanswered questions. One or two are fine—hell, the alien has always been shrouded in mystery and that’s a part of the attraction—but Prometheus had promised us answers and failed to deliver big time although we did come away knowing more about the alien than when we went in so in that respect it did not lie but then it presented us with a whole pile of questions we’d never thought to ask. Now, IF it’d been made clear to us that this wasn’t a standalone film and it was only raising questions to draw us back then fine but that’s not how I recall it being sold. It was marketed as a prequel to Alien. Its original title (one of many I suppose) was Aliens: Engineers which I think I would’ve preferred. I couldn’t tell you how many times I’ve seen Blade Runner in all its cuts but what I can tell you is that it improves with subsequent viewings. Yes, it loses something too, its edge, because we know what’s coming, but what comes to the fore is its subtlety and attention to detail once you can sit back in your seat. I suspect the same’ll be true of Prometheus and I’m rather regretting not taping it when it was on last but I think I’ll find a copy and watch it again the next time Carrie’s in the States; you’ve piqued my interest. It is a problem these days—and not just with films, I would say books even more so—no one thinks they’ve the time to waste watching something more than once because there’s so much new coming down the line. One of the questions I ask of myself when reviewing books is: Could it be reread? Well, yes, of course; everything can be reread. But would it be a worthwhile experience? “One cannot read a book: one can only reread it,” maintained Nabokov. I wonder what his thoughts on cinema were.